Ok, so I may have a slight obsession with bananas. Along with cooking them until they are as caramelized and delicious as can be. 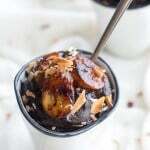 Yes, it was just a week ago that I told you guys about this Chocolate Avocado Mousse with Caramelized Bananas. And man, remembering back that had coconut in it too. Oops. But, I just cannot help it. I mean, the last few weeks have just been so much meat. It has left me craving greens, hearty breads and apparently coconut, bananas and chocolate. To me, this is winter comfort food. Especially a warm, moist, chocolatey slice with a glass of cold milk. Yeah, that is just perfect. 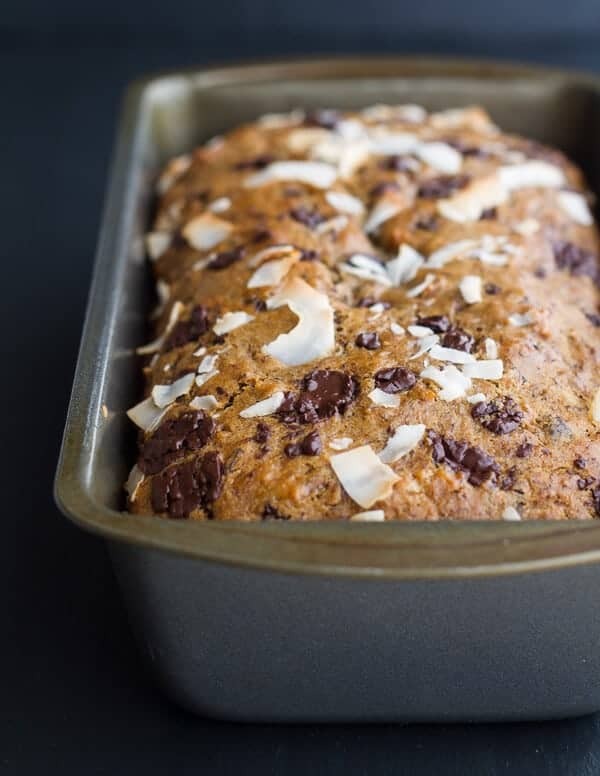 I kind of feel like this Tuesday needs some chocolate chunk banana bread. Is it me or does it feel like this week is moving way to slow? Is it really only Tuesday? Wait, actually the days are going by in record speed, but what I mean is that Friday could not come fast enough. Moving makes the house look like a war zone and it is starting to stress me out. We have to be completely out of the old house by the 15th. That means all cleaned up and looking good. So at least then we can concentrate on getting the new place organized. Great house, but not enough storage! Where to put everything – yikes! And that is about all the words I have for you today. I have started writing these next four paragraphs at least ten times and erased single every word. I do have things to say and tell. Things like how my weirdo brother Brendan is the star in the new McDonald’s commercial or how my thirteen and eighteen year old brothers are currently living it up on five course meals in Europe at the Burton European Open (snowboard competition) being chaperoned by the Red Bull and Burton team managers. I could also go on and on about the fact that my house is in a state of complete disaster or on a more positive and exciting note, I could be sharing with you all my ideas about the Barn. 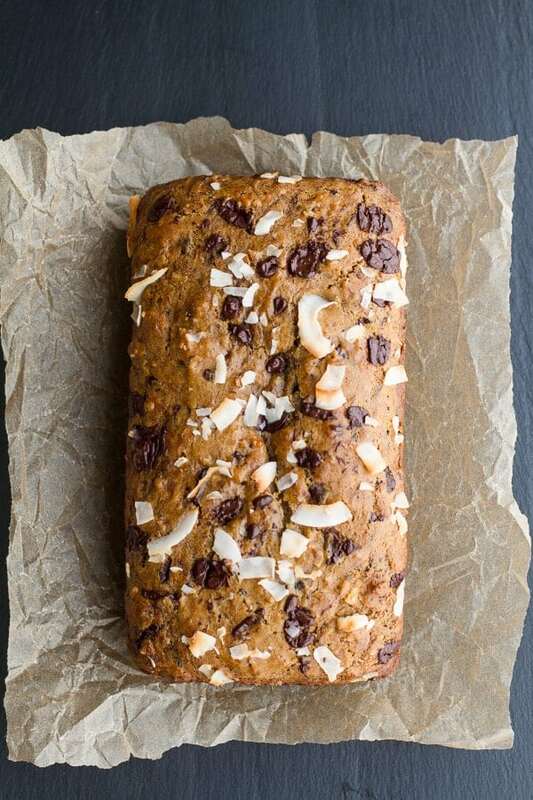 Or I could just simply let you know how you should really try this banana bread, because not only is it delicious, it’s really quite healthy – but nothing is flowing. Like nothing. And as shown in the paragraph above, my proper use of the English language is not up to par either. So for today I am just going to leave you with the concept that you really should make this bread. It is quick, easy and awesome, and the bread is so moist with incredible flavor. Roasted bananas are where it is at. Especially when combined with chocolate and coconut. 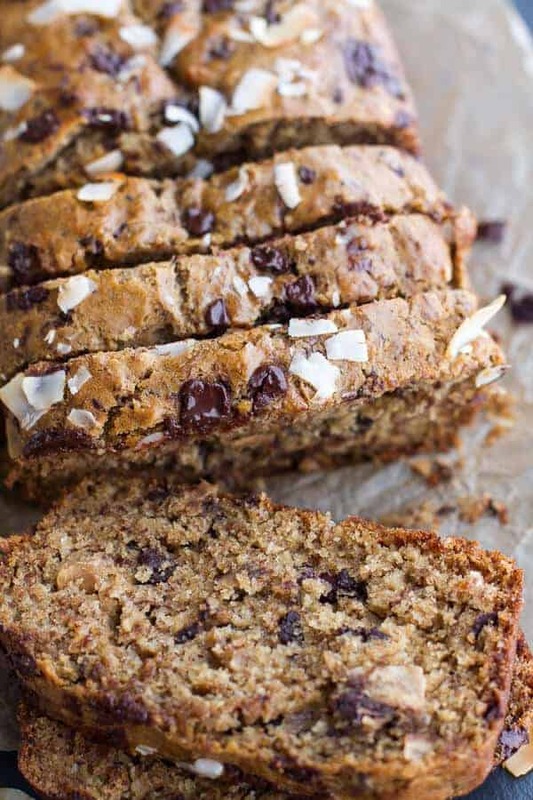 Ooey gooey banana bread can fix almost anything. This is winter comfort food. Especially a warm, moist, chocolatey slice with a glass of cold milk. Yeah, that is just perfect. 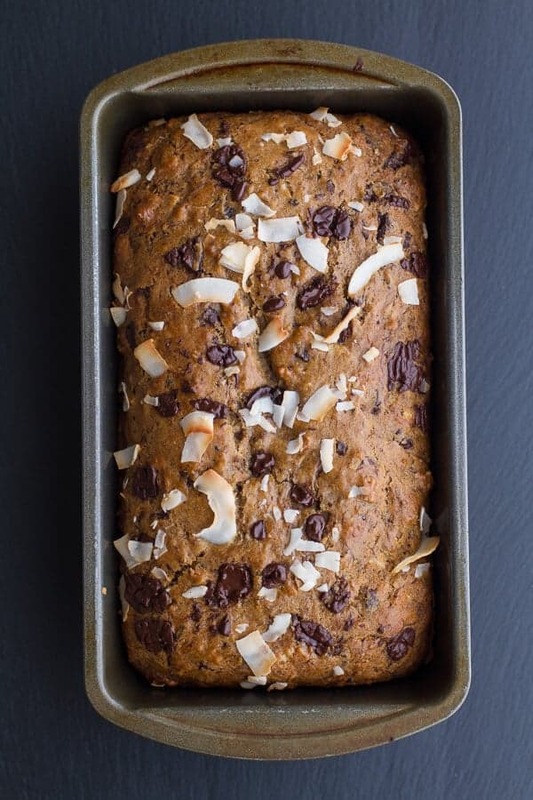 I love that you got 4 bananas into 1 loaf, that there’s honey, coconut, choc chips…I love banana bread and this would be right up my alley! And again, your black board is looking awesome with those choc chips 🙂 pinned to my banana bread board! This is gorgeous. Banana, chocolate bread is one of my favorites. You did it right. Pinning. Thank you so much, Laura! You have to give roasted bananas a try. So good! LOVE the roasted bananas in your banana bread, Tieghan! Also, that there is coconut in there as well as chocolate chunks. Mmmm. All of my favorites. Cannot wait to make this! Thanks for sharing, girl. Pinning! The roasted bananas are so good! Love them! This looks so good. 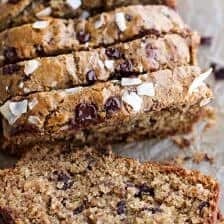 I am not crazy about regular banana bread but I love coconut and dark chocolate. 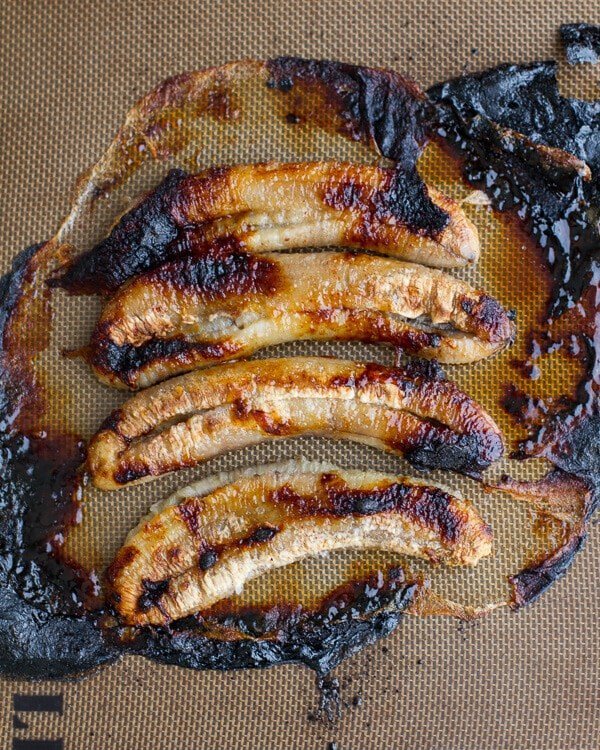 One thing I wonder is, do you put in the burnt part of the banana?? I don’t think I could do that. Good luck with getting it all moved out by tomorrow. I did add the burnt part, but I love that!! If you are not into it, just do not let yours burn at all. I am still getting used to this oven, so I totally burnt these, but like I said I actually like that. It can do what ever you want obviously! Thank you so much, Charlotte!! Things are looking good with the move! YA! Only our new house is a mess! I’ve never roasted bananas before either, but I have 4 sitting on my counter and now I know where they are going. Today is the perfect day for baking this bread – and I have all the ingredients – score! This just came out of the oven and it smells heavenly! YAY! Thanks for making it, Kathy! Oh yeah!! Hope you love this one Kathy!! Thanks! Woh–hold on a sec, your brother is a star of a new McDonald’s commercial?! Umm, I need more details. I love those roasted bananas! 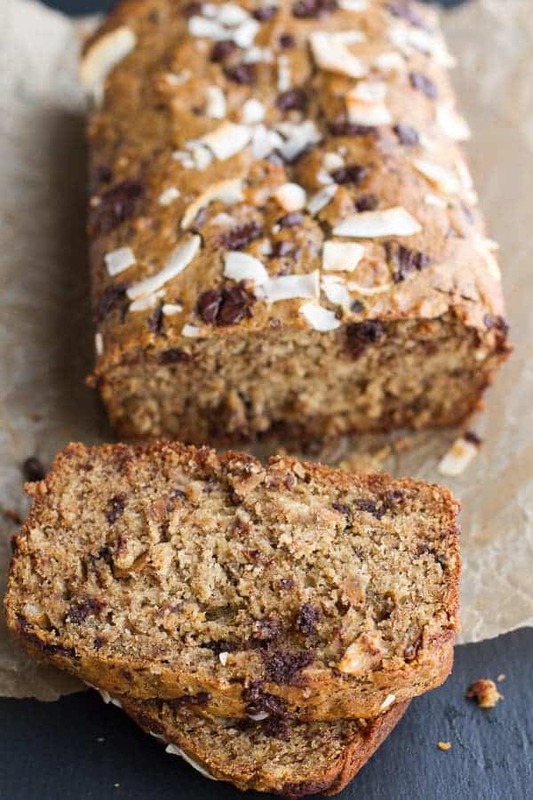 I bet they have so much flavor–and this banana bread looks perfect. It is probably the one baked good that I can NEVER have the will power to turn down. Haha! Yeah, basically he needs money since he tore is LCL over Christmas and cannot snowboard for a little while. So he went and tried out for the McDonalds commercial and got it. I mean, I never knew he could act! Although all he is doing is snowboarding down to some girls and they give him chicken nuggets, so I am not sure how much acting is involved. I’m a horrible baker, but you make baking seem less intimidating!! Haha! You can bake this!! trust me, it is easy! This looks wonderful! I especially like the addition of chocolate and toasted coconut. This really does look delicious! Thank you so much, Jodee!! Chocolate and coconut together is one of my favorite combos! how do your get you bread so perfectly on top? mine always cracks in a million directions – any secrets? Haha! I have no idea. I got lucky with this loaf, trust me that happens all the time to most of my breads. Sorry I have no tips for ya! I hear ya, sister- ooey, gooey banana & chocolate baked goods are what’s been getting me out of bed in the mornings! Good luck with all the craziness in your life right now; sounds like some fun and exciting times! I just died and went to heaven looking at these pictures. Pinned for later (aka can someone PLEASE bring this to me right now while I drink my morning coffee?!)! Haha!! Thanks so much, Katie! This looks TOTALLY amazing I love everything in this bread! Pinning for later! YUM! How I wish I had a generous slice of that right now! Love! Wish I could send you a loaf!! Thanks Jennifer! Thank you! Hope you get to try this bread! 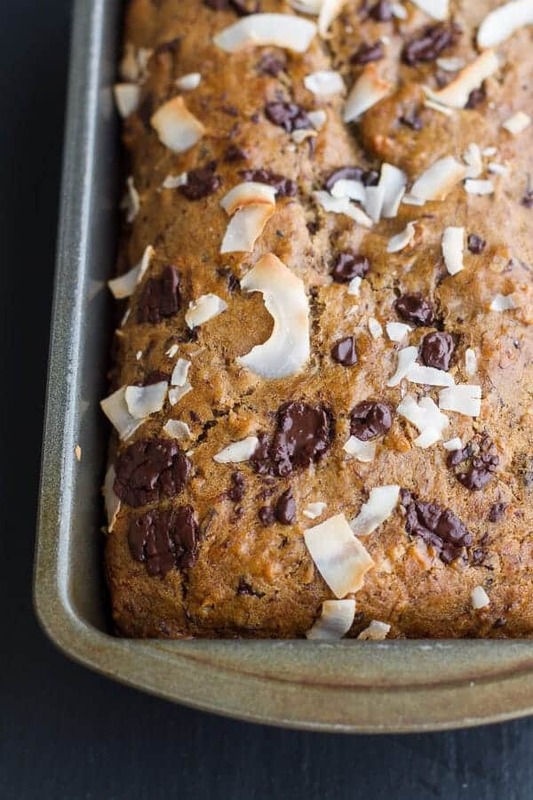 And you’re a genius for using coconut milk in the bread… Way to enhance the flavor! Haha! No way! It is a great combo, one of my favorites! And overachievers? YEAH RIGHT. If only you knew! LOL! I have yet to try roasted bananas to bake with. I can only imagine how wonderful it makes this bread! Love the chunky coconut flakes instead of the shredded. Yum yum and yum! Some of this for breakfast please! How ripe were your bananas when you roasted them — sort of green? black spots? or some other condition? Inquiring minds need to know… Thanks! Hey Pam! My bananas were pretty yellow, but not too yellow that you would not want to eat them as is. I think that anything from yellow to black would work great, just not green. I’m so excited to make this, it looks heavenly! When I make banana bread I usually wait until I have overly ripe (brown) bananas. Do I need brown bananas or did you use yellow bananas? Thanks! Can’t wait to try it! I used yellow, but I think that anything from yellow o brown would work great! Thanks Jenae! Hope you love this! Duuuuude. MIND BLOWN. I love this bread a million times over. This sounds like a really exquisite version of banana bread! I always love chocolate in mine and I bet the coconut milk or yoghurt makes it super moist. Thanks! Aren’t roasted bananas the best? 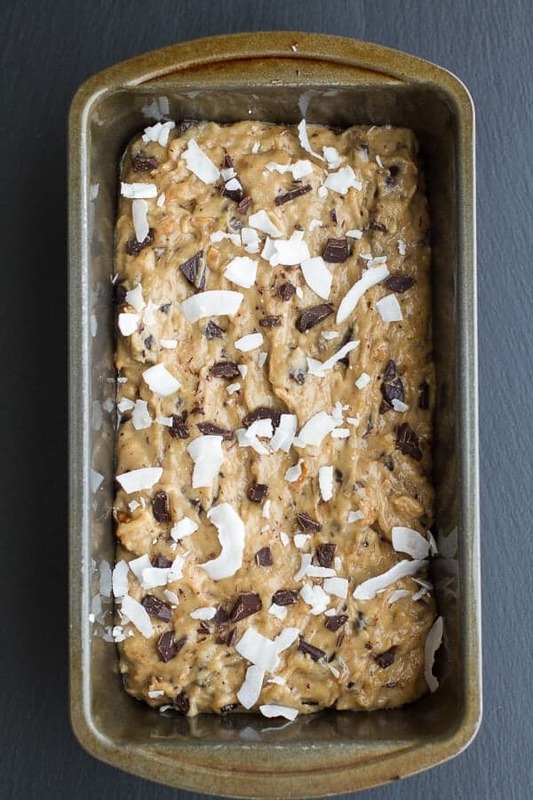 This bread looks so good, love the coconut and chocolate chunks! Yes! They really are so good! Roasted banana bread?! Where do I sign up! Also, you can tell me as much about your barn as you want, I think it sounds amazing! Thank you, Julianne! More about the barn soon! I just made this… it is yummy!!!! Definitely a recipe that is a keeper. Everyone has those days girl. This bread rocks! So cool about your sibs! Big things. Congrats to them! I was just telling my husband that my body can’t handle any more meat. I need to take a break and eat like a rabbit for a bit. Mmm, I’m thinking a slice of this delicious bread would be great, too. A new banana bread recipe for ME. Yay!! And thank you! Haha! I love a nee banana recipe too! Really, I just love bananas! I think that if it is possible you should go half buckwheat half whole wheat. I am afraid if you use all buckwheat flour that the bread will be pretty dense. Hope that answers your question and let me know if you have any more! I made this today!!! I didn’t let my bananas get brown though. I used sucanat instead of sugar and Smart Balance oil. I cooked it at 375 because I was afraid it would brown on the bottom. It was still too brown for me. Wish I had cooked it at 350. It was wonderful when I cut it while it was still warm. When I sliced it cold my husband said it tasted scorched. I froze the rest in slices. Oh I am so sorry, Charlotte! This bread is supposed to be baked at 350 degrees F. not 400 degree F. That was a typo. When you said 375 degrees F. I wondered why you cooked it so high. I am SO sorry!! Glad you still liked the bread though! This makes me blissfully happy! This is the carby trifecta! This. Is. So. Good!!!!!!!!! I made it last night and I suddenly realized that we didn’t have any eggs so I used chia seeds and water and it turned out perfect! This morning half of it was gone and my Dad said “Whatever that banana stuff is, it’s delicious!” Thanks for another great recipe! YAY!! SO happy you guys are loving this bread!! It is one of my favorites! Could you tell me what temperature you roast the bananas? It says 350 then later in the recipe it says to turn down the temperature to 350. I have my bananas roasting right now at 400 with the convection on. Watching carefully as it roasts. The bananas smell wonderful right now. Can not wait to taste the finished bread. You are right! It is 400 to roast the bananas and 350 to bake the bread. So just make sure that when your bananas are done roasting you reduce the temp to 350. Hope you love this bread and sorry about the confusion! Thanks for the reply. The bread was wonderful. Not too sweet, perfect for an afternoon treat with some hot tea. Loved how my house smelled while the bananas, cinnamon and honey roasted. Definately going to make this again. I am really excited about trying this recipe – it looks so good! I realized that I don’t have wheat flour in the house, only white. Does it work with white flour only? Thanks! Yup, it works great with white flour! Hope you love this bread! Just made this. It turned out wonderfully. For anyone contemplating making this.. JUST DO IT!!! It’s heaven. My only thoughts are that I’m not sure if roasting the bananas makes a huge difference in overall taste. This recipe has a slightly more caramelized flavour, but it is honestly so slight that I think it’s almost a waste for me to roast the bananas first. I think I would like this just as well if I added them in raw. Just being honest. Fabulous recipe as always Tieghan..you never disappoint. This looks delicious!! I am definitely making it. Just wondering, whether I should use really ripe bananas for caramelizing or the regular ones will do? Asking since I have always used VERY ripe (blackened) bananas for making a banana bread earlier. Hi! I use really ripe bananas, but whatever you have will work since you are roasting the bananas first. Mine is in the oven right now, it smells like heaven! The batter didn’t fit into the loaf pan, I had to use a larger one instead…I didn’t think my bananas were too big, so I don’t know what happened, I didn’t change the quantities. I’ll report back once we try it! Wow thanks for this, it came out amazing! I’ve just replaced the brown sugar for coconut nectar sugar replacement from here http://www.tiana-coconut.com/ because of the lower G.I. I was wondering if it would be possible to replace the 1/2 cup all-purpose flour as well, what do you think? I apologize if someone else asked this question – I “think” I read through this thoroughly! May this recipe made into muffins/cupcakes, instead of the bread? I have 16 muffins in the oven right now. They seem to be turning out fine. I did use more coconut flakes probably to top all the muffins but otherwise I followed the recipe exactly. 350 degree oven and I’m watching closely. It looks like perhaps 20ish minutes to cook. Just out of the oven. Yum! I had the coconut oil but did not have coconut milk or coconut flakes. I substituted regular milk and oatmeal in place of the coconut flakes. Perfect amount of sugar. I also made muffins instead of the bread. We really like this recipe. Thanks for sharing and also thanks to Huff Post for sharing on the day that I was looking for a recipe for banana bread/muffins. OMG this looks phenominal! I am gluten, dairy, egg and yeast free so was going to swap the flour for buckwheat and plain GF flour? and then instead of eggs use Orgran egg replacer… do you still think this would work??? This was so delicious even with regular oil. I might even add oat to test that next time – maybe too much but this is an awesome recipe. Thank you for sharing!! I made this yesterday. I used Greek Yogurt and canola oil- and followed the recipe exactly. I did, however, put it into 4 small loaf pans as opposed to one, but of course, adjusted the time accordingly. (I do this with my regular banana bread recipe). It turned out very bland, despite doing the bananas in the oven beforehand. It was on the dry side as well. Do you think the small loaf pans (4) made that much of a difference? I do not think that pans would have made a difference unless you cooked the loaves a little too long. I can’t believe it was bland though, this is one of my favorite banana bread recipes. So sorry it did not work out for you. No worries- I will try again, but this time with the coconut milk and oil. I was watching it very carefully, so I don’t think I overcooked it (kept adding 2 minutes until knife came out clean). Thanks for getting back so quickly! I seriously have made this recipe about a billion times, it’s my absolute favorite banana bread recipe. I have one question- my bananas never turn out roast-y enough like the ones in your pictures (even if they were a teensy burnt on accident). I’ve tried adjusting the time to see if leaving them in longer makes a difference and it never does. I just can’t figure it out! Any thoughts? Hi! That is honestly so odd. Maybe try removing the peel before roasting. I would think that would do it. Let me know! Just made this again this morning. It was the most perfect looking loaf of any kind of bread I have ever made. I lowered the temp to 335 and used all white whole wheat flour. I didn’t do the roasting of the bananas like before. Was in a hurry and didn’t want to wait. I did put them in a pan with the honey and cinnamon and cooked for a while. It was wonderful!! SO happy you love this recipe! It is one of my favorites too! Making this for the third time right now. Everyone I’ve shared the finished product with has loved it! Thanks for such a perfect recipe. Is that dark unsweetened baking chocolate or sweetened? 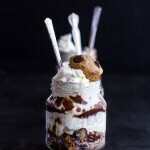 Can I use dark chocolate chips? Thank you. I just got back from the store to buy the ingredients for this recipe and alas they did not have any white whole wheat or whole wheat pastry flour. I purchased a small bag of whole wheat flour and wonder if you have any tips on perhaps combining some more white flour in this recipe. Would that work? HI! Amy, I would use half white flour and half whole wheat. Let me know if you have questions. This banana bread turned out great! The bananas were very ripe and contained quite a bit of liquid after they were baked during the initial step. I ended up cooking the loaf about 70 minutes. Excellent! Thanks so much for the great recipe. I will no longer toss those brown bananas. Hi Arlene! Thats so awesome it came out well for you! (: Making me want to whip a loaf up right now!! Thanks!! I have been meaning to make this bread for over a year! But I’m such a banana fiend that I never have enough around when I get in the baking mood. Needless to say, over the course of the year, my expectations for this recipe had been build up pretty high…and can I just tell you: it more than delivered. THIS BREAD IS SO FREAKING GOOD. I’m kicking myself for not making it sooner. 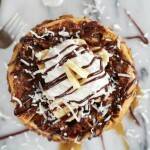 I could have been eating this banana-y, coconutty, chocolaty goodness a whole year ago! I now feel like I deprived myself. Seriously. Thank you. This is my new favourite banana bread recipe! Thank you Asha! So happy you enjoyed it!! hello – do you have to use coconut milk or can you substitute ? Hi Felicia Ceraso, you can use regular milk as well. Let me know if you have questions, thanks! Made this bread this morning, and it was amazing! The smell of the bananas, honey, and cinnamon in the oven, followed by the toasted coconut… absolutely intoxicating. What a great recipe. Thank you! Aw, awesome! Couldn’t be happier that you liked it, thanks Karen! Great! I hope you love it! Thank you! I hope you enjoy this! Thanks! Does the bananas have to be soft/going bad. Can. You use fresh bananas? How many cups is four bananas equivalent too? It should be around 1 3/4 – 2 cups. I would check this to make sure, though. Please let me know if you have any other questions! 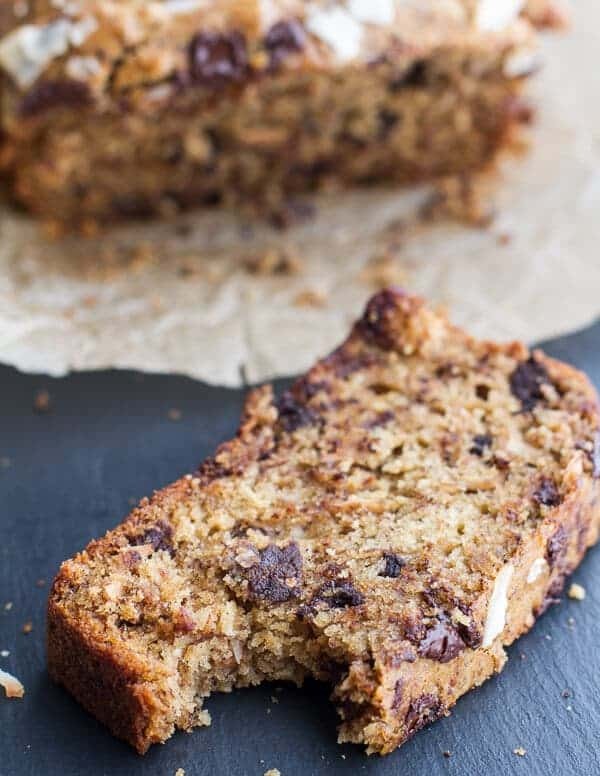 This is one of the most incredible banana bread recipes that I have EVER tried… and I’ve tried Alot! It is so incredibly moist and packed with flavor! It’s my new ‘go to’ recipe. Thanks for sharing this! Thank you Anita! I am so glad you enjoyed this! I made this a few years ago. I questioned the high temp. It still says 400 degrees. In your reply you said 350 degrees. I am making it again today and using 350. It was too brown when I lowered it to 375 before I sent you the message. Great recipe; so delicious! I had frozen bananas, so skipped the roasting part (unfortunately – next time!) and added the honey and cinnamon into the batter separately. I also had some buttermilk to use, so just added coconut milk powder to it. Also subbed shredded coconut for the flakes. Only needed 50 minutes in my oven, at 190C. Turned out delicious! Will add more chocolate next time, and of course roast the nanas 😉 Thank you for an amazing recipe, Tieghan! I am so glad this turned out so well for you, Melissa! Thank you for trying it! Hello! 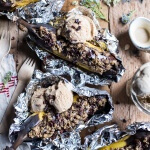 I want to make this, but don’t have the patience to roast the bananas? Can I skip this step? 🙂 I also only have 3 ripe bananas…. Could you use all all purpose flour? Omitting pastry flour?